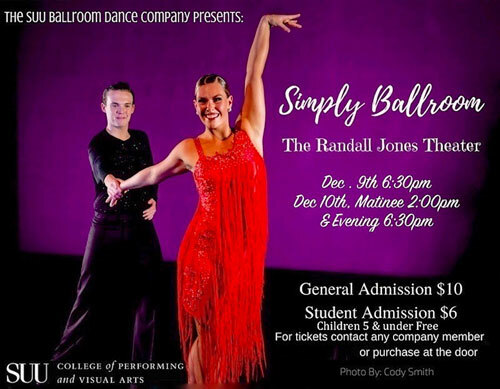 The Southern Utah University Ballroom Dance Company presents Simply Ballroom in the Randall L Jones Theatre Friday and Saturday, December 9-10 at 6:30 p.m. with a matinee on Saturday at 2:00 p.m. Tickets are $10 for adults, $6 for students, and children 5 years old and under are free. Tickets can be purchased from any company member or at the door. Don’t miss this educating and entertaining dance concert. For more information, please visit Ballroom Dance Company.